It is a struggle to see how BMW can legitimately claim the GT is a Grand Tourer due to its poor storage capacity. Yes, the fairing is more protective and the seat comfier than on the X, but that doesn’t constitute a tourer, it simply makes the GT a more relaxed commuter when compared to the X.
BMW needed to give the GT enhanced underseat storage to justify their Grand Tourer claims because, as it is, the GT is just an X with a bit more weather protection and a softer seat. Executive maybe, but certainly not a Grand Tourer and that’s a bit of a shame. 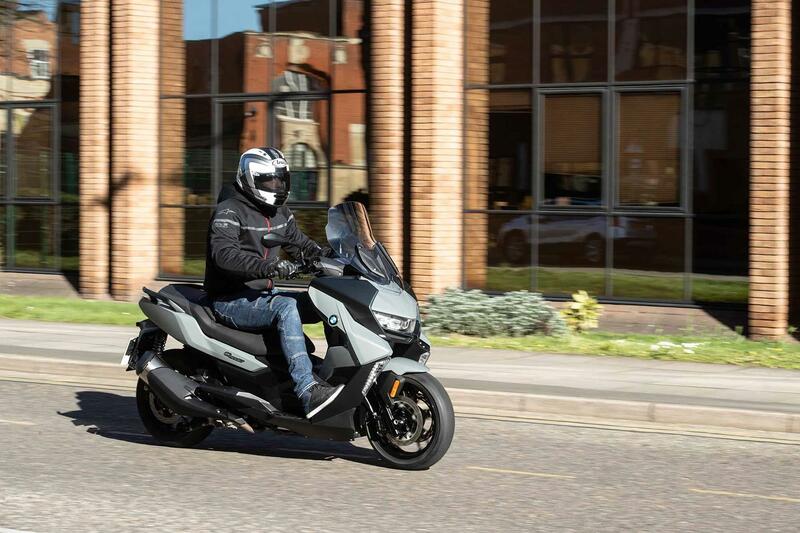 The C400 range have been designed as sporty middleweight scooters and as such they do handle impressively well. On the open road the GT turns quickly and is fun while at speed it remains stable. The suspension is a bit choppy, especially the shocks, but it’s a comfortable riding position with the GT’s increase in padding in its seat and wider nose improving comfort levels over the X model. That said, riders over six-feet tall may want the BMW accessory taller screen as the OE unit is a touch short and irritatingly isn’t adjustable in its height. Through town the GT is light and nippy with an excellent turning circle and the ABS and TC do their job with little to find fault with. The main issue with the GT is its lack of underseat storage, which is a real letdown on a bike that bills itself as a Grand Tourer. 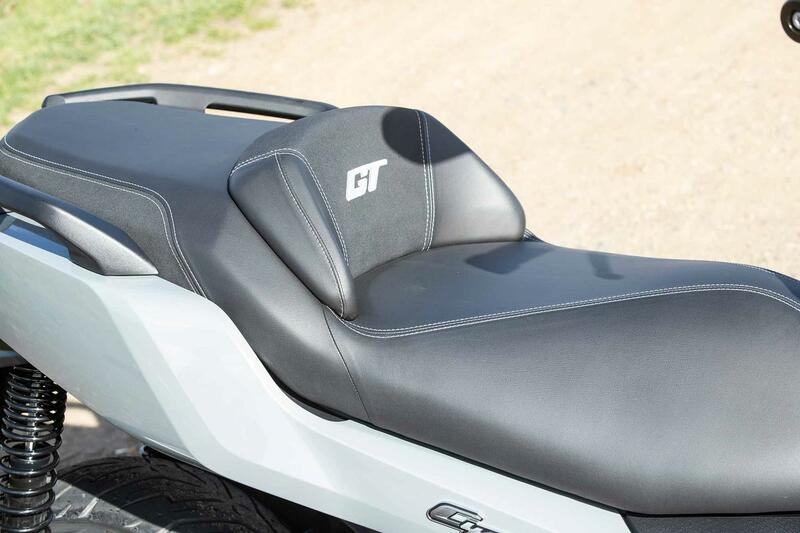 Powered by a 350cc single cylinder motor that has had its CVT tailored for acceleration, the GT is rapid away from a standstill and can haul up to an indicated high-80mph, which is quite impressive. 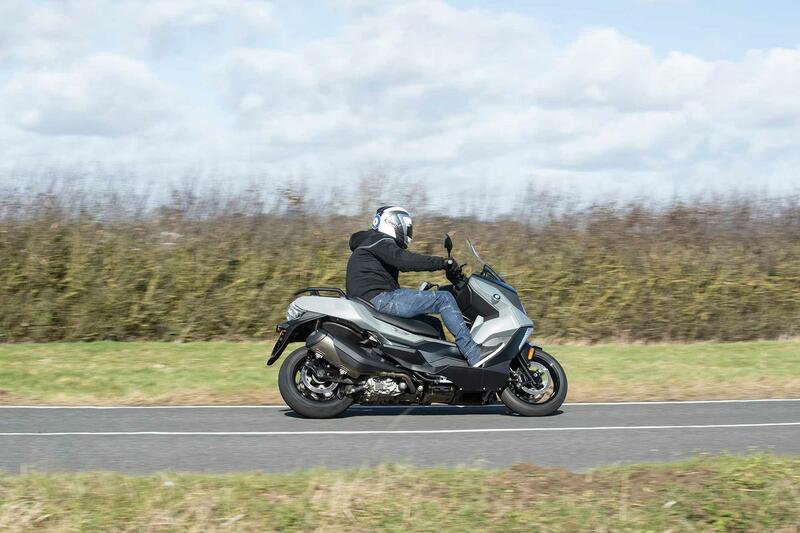 As well as decent levels of torque, the single is pleasingly vibration-free, meaning the mirrors remain clear and the rider’s comfort levels aren’t compromised. A claimed 80mpg is also very respectable, giving the GT a theoretical tank range of just over 200-miles. This is a BMW product, so you can expect decent reliability all backed up by an excellent dealer network. There should be no horrors and the addition of a stainless steel exhaust is a nice touch when it comes to longevity. The GT builds on the C400X’s base and where the X starts at £6200, prices for the GT begin at £7050. For this base price you get ABS, traction control and a keyless ignition as standard, however to add a TFT dash it is £595 and heated grips and seat is a further £390. 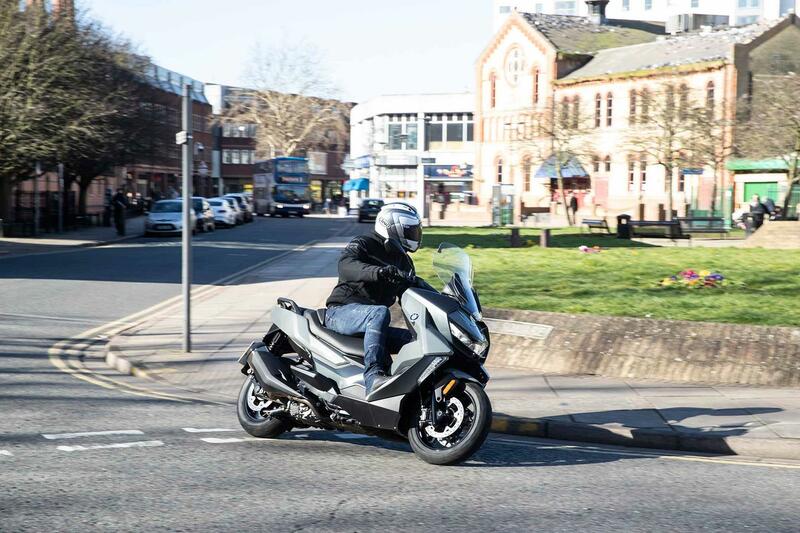 The Yamaha XMAX 400 is £6149 and has ABS, TC, an adjustable screen and a keyless ignition as standard while the Suzuki Burgman 400 relies on just ABS for £6399. 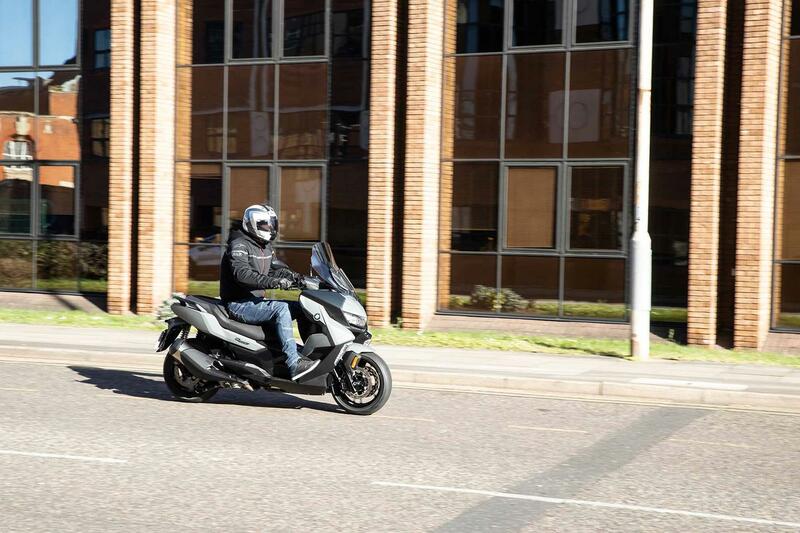 The £5599 Kymco Xciting 400i is smartphone connected and has ABS and an adjustable screen. So the BMW is certainly a premium model in the middleweight scooter segment. You get ABS and ASC (traction control) as standard on the C400GT as well as LED lights, a 12V socket, stainless steel exhaust, centre stand, keyless ignition and an immobilisor system, which isn’t a bad level of spec however as with all BMW models you need to tick the optional extra box to really make the difference. 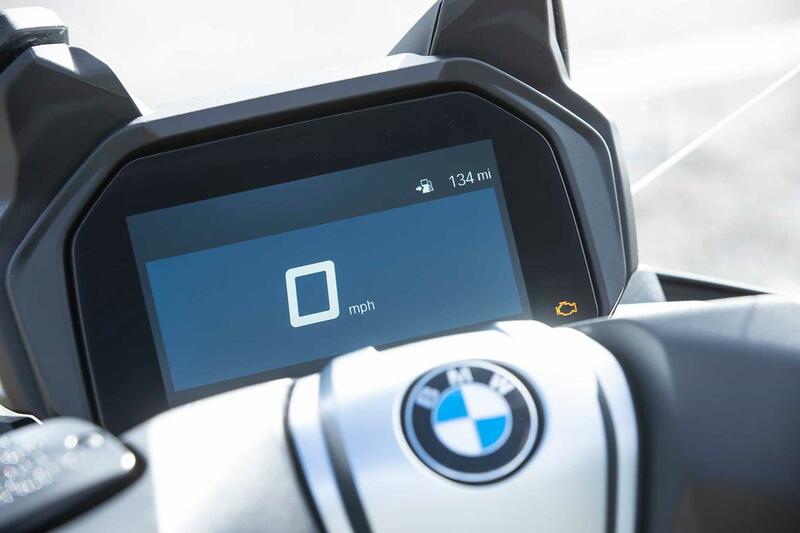 Smartphone connectivity to a TFT dash and heated grips and seat are options on the list of BMW accessories that also includes an alarm, taller screen and luggage. Underseat storage is limited, but BMW’s Flexcase system expands the underseat storage area when the bike is stationary to allow it to hold a full-face lid alongside a half-face one and there is an accessory 30-litre top box. The model was introduced in 2019. There is no prior history. 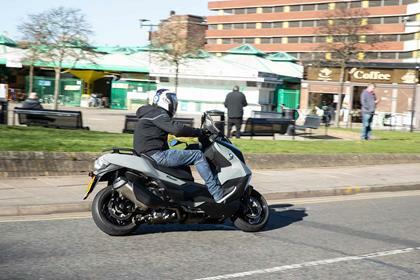 The BMW C400X is a sportier targeted scooter with bolder styling and a smaller front fairing. The C400GT SE is simply a GT with a few factory-fit options (TFT dash and comfort package) included in its spec. It costs £7995. No owners have yet reviewed the BMW C400GT (2019-on).